A hernia forms when the abdominal wall weakens, bulges, or tears. The inner lining of the abdomen and small intestine can poke out of this weakened area. A hernia repair is a surgery to push the abdominal material back where it belongs and to repair the abdominal wall. A hernia repair is done if the hernia is large and causing pain. Strangulated hernias can cut off blood supply and require immediate hernia repair surgery. Without surgery, the hernia will not heal. 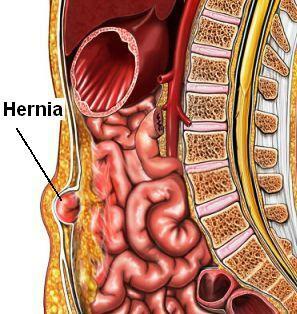 The pain and size of the hernia usually increases over time. ECG to measure electrical activity of the heart. There are 2 main types of surgeries. A conventional surgery or laparoscopic surgery. Conventional surgery uses a large incision so that the doctor can directly access the area. Laparoscopic surgery uses smaller incisions and special surgical tools. You and your doctor will discuss the risks and benefits of each surgery to determine which may be best for you. Factors like your overall health, location of hernia, and complications will play a role in the decision. An incision is made over the hernia site. The hernia will be moved back into the abdominal cavity, or the sac may be removed. In the case of hiatal hernia, the stomach is moved from the chest cavity back down to the abdominal cavity. For some, the weakened muscles that allowed the hernia to develop are sewn together. If the weakened area is large or in the groin, a piece of mesh will be placed over the area to create a new wall. If mesh is used, the muscle is not sewn together. The incision will be closed with stitches or staples. Small incisions will be made around the hernia. Special surgical tools will be placed through these incisions. A small camera will be passed through an incision so that the doctor can see inside the abdomen. Other small instruments will be used to complete the repair. After the procedure, the incisions will be closed with stitches or staples. A sterile dressing will be applied. You will be taken to a recovery area. Fluids and pain medications will be delivered through an IV. If there are no problems, you will be moved to a hospital room to recover. At home, slowly return to to normal activity and diet. Your doctor may advise pain medications. You will have to restrict activities during your recovery. Avoid straining and heavy lifting until your doctor says it is okay to do so. Follow wound care instructions to avoid infection. The recovery time will be shorter for laparoscopic surgery. Groin hernia in adults and adolescents. EBSCO DynaMed Plus website. Available at: http://www.dynamed.com/topics/dmp~AN~T113880/Groin-hernia-in-adults-and-adolescents. Updated March 14, 2018. Accessed March 26, 2018. Inguinal hernia. Johns Hopkins Medicine website. Available at: https://www.hopkinsmedicine.org/healthlibrary/conditions/adult/digestive%5Fdisorders/inguinal%5Fhernia%5F85,p00387. Accessed March 26, 2018.